Monster trucks aren’t exactly respected the way traditional motorsports are, but they are no less thrilling! At a monster truck rally, you’ll bear witness to enormous machines of metal, the overwhelming smell of fuel and rubber, as cars crush each other in a glorious event. The exploding metal and glass creates an awe-inspiring spectacle that sometimes can resemble a discounted fireworks display. Monster truck rallies are usually centered-around watching them pancake their smaller cars, sacrificing them for the entertainment of the crowd. But there is so much more than meets the initial roar to these metal-clad beasts, and check out inside peak under the hood of these monsters! The main event, usually given brazen names like “Bulldozer Brawl” – may be the ultimate star of the show, but it’s not the only reason large crowds buy tickets to these shows. As Monster Trucks grew in popularity, promoters started adding other events such as mud racing, sand drags, hill climbs, and the infamous demolition derby. As the definition of what a Monster Truck show changed, so too did the trucks themselves. Today they are bigger, and yet they manage to be faster and more agile than ever before. They have to be in order to stay in their lanes for complex obstacle courses as opposed to flying off into the stadium seats. Designing them is no easy task when you’re dealing with the sheer size they need to be to excite viewers but also must remain drivable from the inside. What does it take to make a monster? St. Louis, Missouri is the home of the most famous big-wheeler of them all—Bigfoot. Not to be confused with the infamous and elusive Sasquatch who may or may not exist, there are actually 12 Bigfoots trucks. And together they encompass about 3 generations of vehicular development. Let us begin with the outside, or “skin” as some have come to call it. It’s molded in the style of a Ford pickup truck and made up of fiberglass with doors and headlights painted on instead of made to be functional. The skin covers a frame made in part from chrome-only steel tubing, the very same that they use to create stadium race trucks. Inside the monster truck might not look very comfortable. That’s actually on purpose. Safety is a higher concern than drivers feeling like sitting in these machines for an extended period of time. Older monster trucks ended up bashing drivers around inside. It looked and was very painful. Now they are built to better ease the shock loads, keeping drivers more secure and hopefully to cut down on the medical bills. 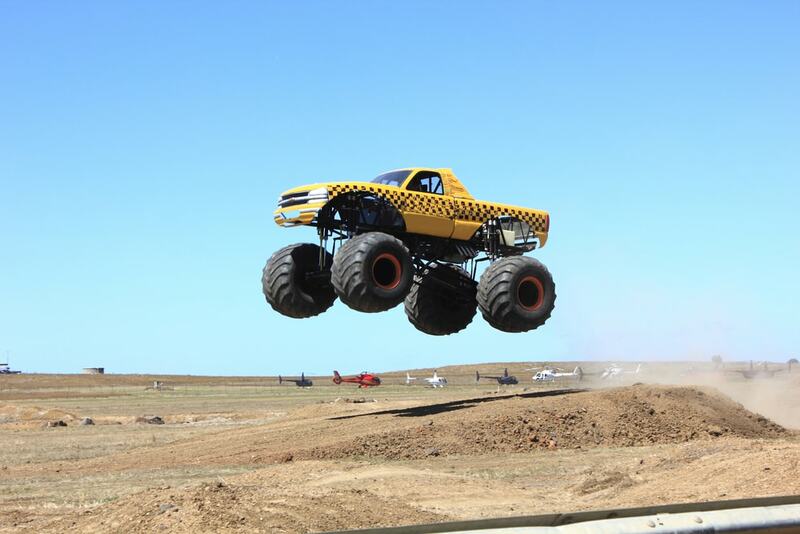 Every monster truck utilizes a very generous suspension system that allows them to go faster and jump higher. And it does all of those things while still allowing the monster truck to remain stable and even. The way the suspension works is that is uses a four link setup. From the pivot point at the center of the vehicle out comer four bars at the correct points on the axels. Then there’s a system of nitrogen-charged shocks on every corner that keeps a consistent ride height along with “bouncy” aspects. As the truck starts driving, the shocks move two inches for every inch of wheel movement but later on they compress into their last stage for a dampening ratio of 1:1. Usually in monster trucks, drive shafts and tie rods and other parts are crafted by hand. You can’t buy them from a store. Others are adapted from agricultural and industrial applications. The same goes for the custom-made one-piece rims (which for that size are safer and lighter than two-piece rims). The tires are 66x43x25 Firestone Terra tires which are usually equipped on 30-mile-per-hour liquid fertilizer spreaders. And off of this would mean nothing if it weren’t for the Ford Motorsport high-nickel-content cast-iron 460 cylinder block that’s bored and stroked to 500 cubic inches. This engine uses a Crower fuel injection system is also given a major boost by a 30 percent overdriven Blower Drive Service 8-71 supercharge. This monster has muscle. 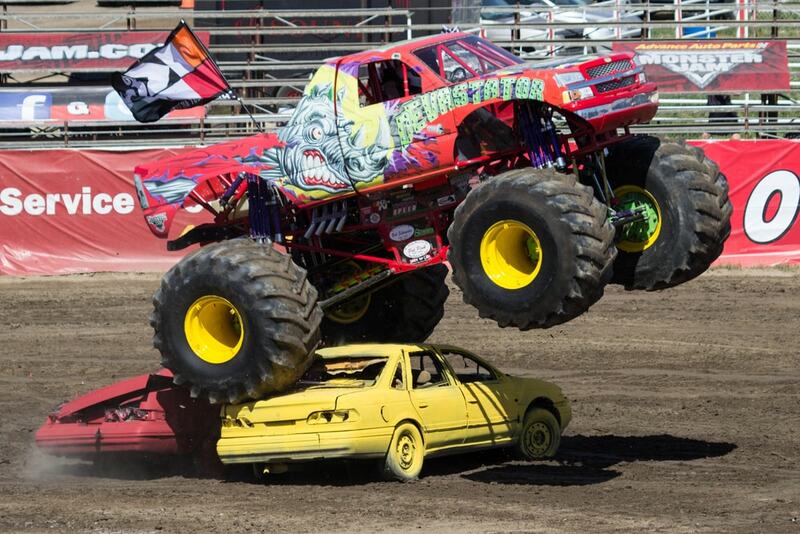 Most monster trucks come equipped with four-wheel steering. The hydraulics, borrowed from various agricultural and industrial machines actually turn the steering knuckles on front and rear axles. It is this very system that allows the trucks to stick the landing on jumps and maintain integrity. These days, monster trucks now come with computer-designed equipment and also on board computers to make them more efficient, but no less monstrous machines.